For the as long as I’ve been wet shaving, I wanted to do so in the shower. Warm air holds more moisture and since you’re already under the water, this setting is ideal for saturating your facial hair and thus obtaining the best possible shave. To make this happen, I needed to find a shower mirror that is easy to install, wouldn’t fog up and is reasonably priced. 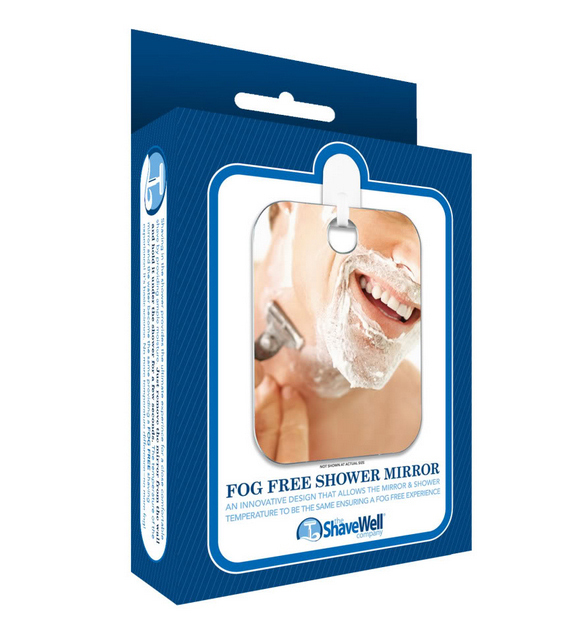 I recently purchased the Fog Free Shower Mirror by ShaveWell and I couldn’t be happier. For starters, the Fog Free Shower Mirror is Apple-esque in its out of the box ready to use ease. The package includes minimal but easy to understand instructions, a plastic hook and the mirror. The hook is one of these super strong adhesives and it only requires cleaning with area of the wall you intend to hang it with some rubbing alcohol. Once you let it dry, the instructions indicate waiting 2 hours, your mirror is ready to be hung. (You can also use one of these Command Water-Resistant hooks, which I did.) Ease of installation – Check! The mirror comes with a protective coating that you ultimately remove. Once this is done and when you’re ready to shave, you hold both the back and front of the mirror under the shower stream to warm it up. This one tactic is the brilliance of this mirror. When the mirror in your bathroom fogs up, what’s happening is the warm air from your shower, which is saturated with moisture, comes in contact with the cooler surface of the mirror. As a result, the moisture is sucked out of the air and falls onto the mirror. To reverse this action, you simply raise the temperature of the mirror to equal that of the air inside the shower. No fog – ehh! Here’s the best part of this whole thing, the starting price for ShaveWell’s Fog Free Shower Mirror is $9.99 on Amazon. For $3 more, I ordered the Deluxe, which is bigger than their original mirror. The size is perfect as I can comfortably see enough of my face to guide myself through my shave. Reasonably priced – Check! There really isn’t anything bad I can say about this mirror. For the price, you aren’t buying aesthetics. It’s a simple mirror that’s super easy to install. With respect to no fog, I truly expected that it would never fog up. Chalk that expectation up to its name but that hasn’t deterred from how satisfied I am with this product. When this happens it’s usually right before I’m about to shave. By that time, the mirror’s surface is still cooler than the temperature of the air inside my shower. That’s quickly remedied, however, by submerging both sides of the mirror under the shower stream for a few seconds to warm it up. Be sure to install your mirror in a place that’s not subjected to a draft as that will cool the mirror’s surface too. Using the Command Water-Resistant strips I mentioned will allow you to move the mirror around, if necessary, to find the ideal spot in your shower. Bottom line, I cannot remember the last time I spent this little money on a product and was this thrilled. My shaving experience is better for it too. This entry was posted in Product review and tagged details, Men's grooming, Men's Grooming Essentials, Shower Mirrors, Wet Shaving. Bookmark the permalink. Can’t beat the great price and ease of installation. Looks and sounds too good to pass up.